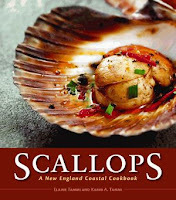 Local authors Elaine and Karin Tammi take our audience through the process, using their new cookbook Scallops: A New England Coastal Cookbook as an example. During the creation of their book, they received encouragement from Julia Child, who wrote, “You have done a wonderful bit of research and it should be known. It’s just a matter of getting it to the right people.” The authors obtained recipes from celebrity chefs and scallop fishermen, and they interviewed scientists. They will review concept, text, and selection of images. Large photographs from their cookbook will be shown. Afterwards, feel free to ask questions. Their cookbook will be available for sale and signing.